In just 10 years, the Prius has gone from misfit to beloved hybrid, and our love affair with the little Toyota has resulted in well over one million Prius purchases, most of which are still on the road today. But the Prius isn’t perfect, and its compact shape has meant that some buyers just can’t fit everything – and everyone – inside. That’s the business case behind the 2012 Prius v (‘v’ stands for versatility), the first addition to the extended Prius family. Essentially, it’s a bigger Prius. There’s more cargo space, more room for passengers, and more technology. The Prius v uses the same gas/electric hybrid system that the third-generation Prius uses, achieving 42 mpg combined, and it offers up a slew of information and entertainment options, including Entune – a way to use phone apps through your car’s standard touchscreen system. But what the Prius v really does best is go after the compact SUVs and wagons currently on the market. Its 67.3 cubic feet of space with the rear seats folded down beats that of the Kia Sportage, Volkswagen Tiguan, and Hyundai Tucson, and it's nearly identical to the Volkswagen Jetta Sportwagen TDI’s and the Ford Escape Hybrid’s. The Prius v may not outstrip the competition in a drag race, but it might well change the way we think about the necessity of bigger cars on the road. Making the Prius larger has done the trick – the Prius v has a ton of cargo space (almost 30 more cubic feet of space over the Prius), plus under-floor storage as well. There are plenty of cubby spaces throughout the cabin and five cup holders in the front alone! Visibility is better, and so are the driving dynamics. A standard touchscreen houses a backup camera too. 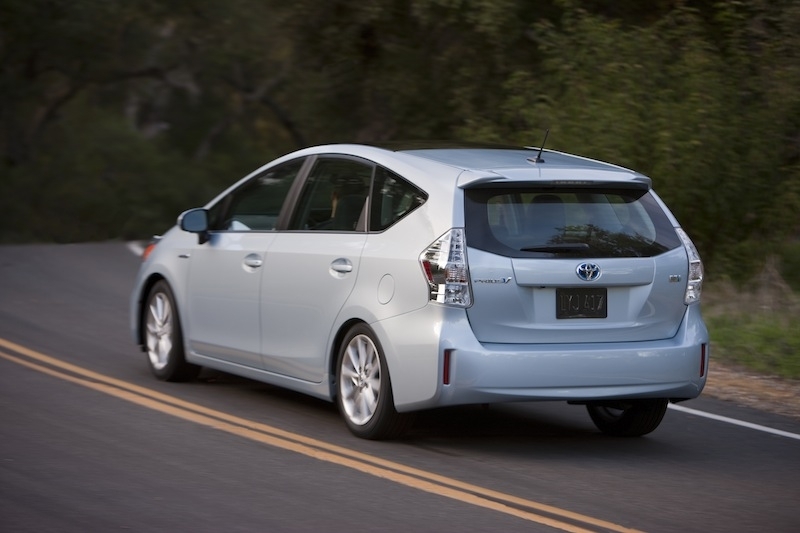 Fuel economy drops from the 50 mpg you get in the liftback Prius to 42 mpg combined. The large cabin space tends to make noises echo more, increasing the sound level; this doesn’t help with the already imposing road noise. The center instrument panel is cluttered and a little fussy. Taller drivers may love the headroom but hate that the steering wheel doesn’t telescope very far. It uses premium fuel – not great for the wallet. 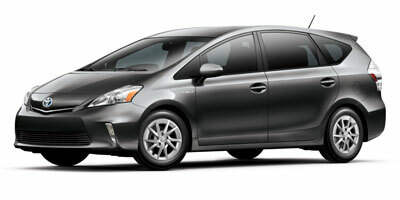 The Prius is hardly a racecar, but modifications included in the Prius v make for a smoother ride overall. There’s less pitch and roll – or “porpoisingâ€ as Toyota calls it, so the ride feels more level over bumpy roads. Surprisingly, there’s a good amount (perhaps too much) of road feel, which makes for a less floaty ride and helps it feel more secure in corners. With a bigger car comes more glass, and visibility is indeed fantastic. 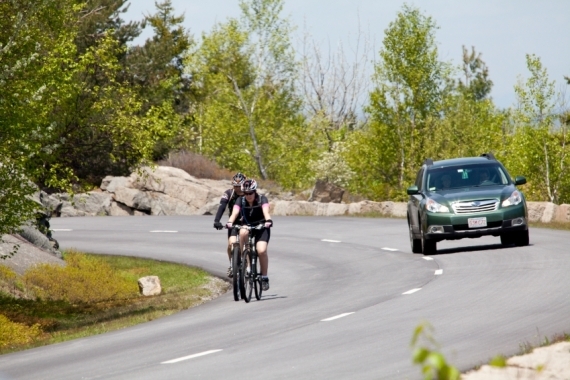 There are few blind spots and the front windshield offers up a wide view of the road. A number of different drive modes give you a wide range of efficiency options. Power gives you more on-demand acceleration to help add some spirit to the drive – though you can also access full power by simply flooring the throttle. 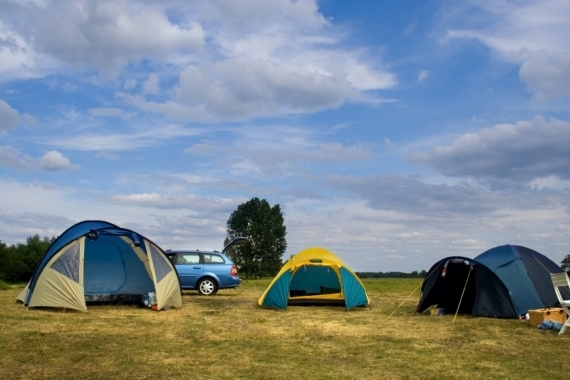 Eco and EV mode employ a variety of techniques to reduce consumption if you feel like being an eco-warrior. Using the same hybrid system found in the Prius and other Toyota hybrid models, the Prius v’s 1.8-liter engine and electric motor combine to achieve 134 horsepower. Regenerative brakes utilize stopping power to recharge the battery for longer battery usage. You’ll be able to monitor engine and battery input through a large and clear display in the central screen. Standard on all Prius v models is a backup camera, with the image inset into the standard touch screen – a bonus for a base trim. Those features are paired with rear reclining seats, Bluetooth connectivity and a handy charging area between the two front seats for all your gadgets. A standard audio system can be upgraded to the JBL GreenEdge system, which uses weight- and energy-saving technologies throughout the audio system’s components. Entune is the latest way to further connect to the web through your car. It is essentially a platform in which to view and connect to a variety of applications within the vehicle’s touch screen like MovieTickets.com, Bing searches, Pandora stations, iHeartRadio, Open Table restaurant reservations and a number of other features like traffic, weather, sports and news. It’s fairly straightforward to use and the menus are easy to navigate (perhaps more so than Toyota’s own touch-screen interface). The Prius v is only 230 lbs heavier than the Prius, but that discrepancy combined with a loss of aerodynamics and modified gearing has hurt fuel economy considerably. 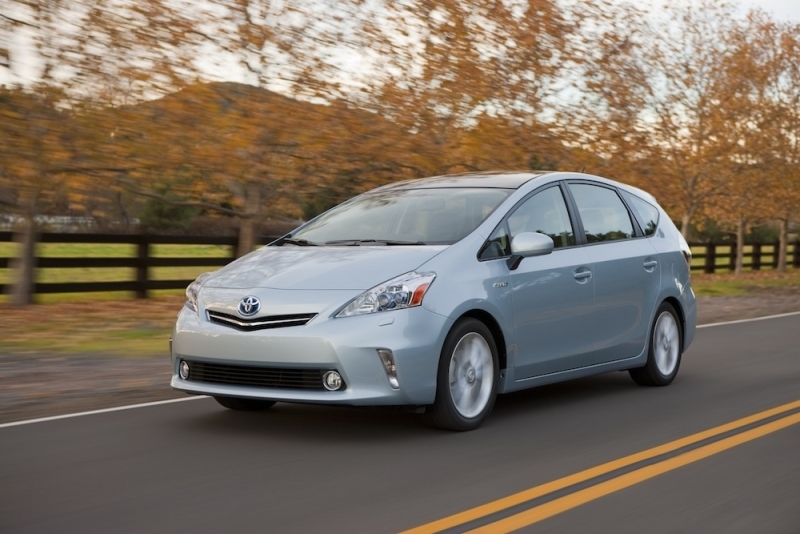 But really, numbers are relative, and the Prius v achieves an amazingly economical 44 mpg city and 40 mpg highway. 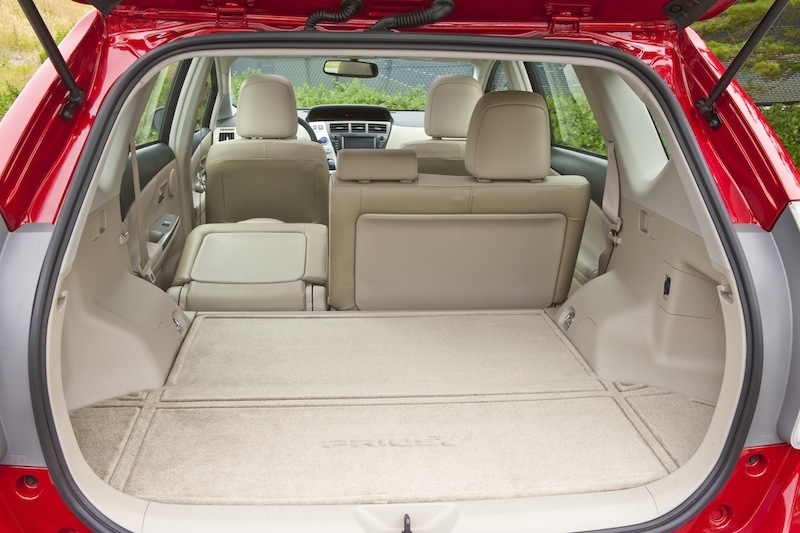 Though that may be shy of the Prius’ 50 mpg, other competitors with this much cargo space don’t come close to besting it. Those familiar with the Prius interior won’t feel out of place in the Prius v. It features a center instrument panel only (no gauges or screens directly in front of the driver) surrounded by a mix of hard and soft plastics, and the design is perhaps less button-heavy now – though the top display is information overload. Storage areas are abundant, so are cup holders, and cargo space is plentiful. An optional panoramic roof opens up the cabin space further. The Prius has never been known for its styling, and while the latest generation looks modern and interesting in small form, a bigger version of it doesn’t exactly elicit looks of longing. The v is six inches longer, three inches taller and one inch wider than its predecessor; with a more upright look, it’s starting to have a minivan-ish bearing, though not an entirely ungraceful one. The Prius v straddles the space between wagon and compact SUV. It has the low roofline and the cargo space to make its closest competitor the Volkswagen Jetta Sportwagen TDI (with almost identical cargo space numbers and similar highway mileage). And expect it to be similar in price too, around $25,000 to start. Other competitors include the Ford Escape Hybrid and the Subaru Outback, but look for Ford’s C-Max to make an appearance in this segment soon. There’s no doubt about it, the Prius v fits a niche that Toyota buyers have been itching to fill. With great gas mileage, plenty of passenger space and cargo room primed for overzealous Ikea trips, the v has done everything right. Enthusiasts won’t be clamoring to hit the autocross courses with these, but modifications have made the Prius v sturdier on the road, a plus for a few, we’re sure.